A large part of our digital marketing campaign will involve content marketing. To execute perfect content marketing, you need a plan. Each offer you make often requires the creation of different pieces of content. As a result, the ideal is to make a content plan for each of your major offers using a resource called the Content Campaign Plan. The Content Campaign Plan aligns your content marketing with business objectives such as generating leads and sales. 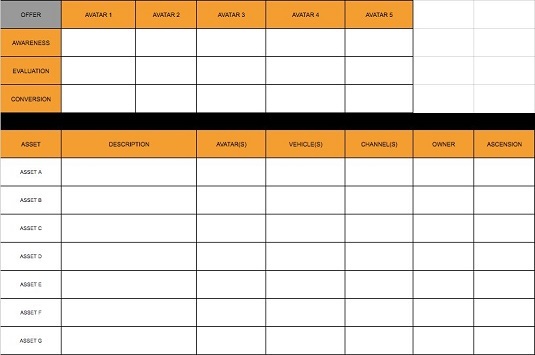 You can see the Content Campaign Plan template and can fill out your own by visiting Digitalmarketer.com. The Content Campaign Plan organizes your content strategy for each individual product or service offer. Choose the vehicle and channel. Read on to find out more about each of these steps. Decide which avatars (also known as a buyer persona) this content targets. Because each avatar has different intents, motivations, and problems he responds to, each avatar requires different content to move him through the awareness, evaluation, and conversion stages. You therefore need to determine which existing content to use or what new content to create to move the avatar through the top, middle, and bottom of the funnel. For example, a wealth management firm attempting to sell financial planning should approach a young professional much differently than a near retiree. Some content will appeal to both, but the most effective content will speak directly to a specific avatar. Use what you know about your customer avatar to create descriptions for content that you can create to reach that persona. Plan to create content at all three stages of the marketing funnel: awareness, evaluation, and conversion. In the wealth management firm example, what content could the firm produce at the top of the funnel to increase awareness for the young professional avatar? What could it produce to move the retiree avatar through the conversion stage? The vehicle of the content refers to the form the content will take. Will it be text, an image, a video, or an audio asset? The channel refers to where the asset will be published — such as your blog, a Facebook page, or a YouTube channel. The vehicle can sometimes determine the channel, and vice versa. For example, a video asset often gets published on YouTube, Facebook, and your blog, whereas an image asset is more likely to be on Pinterest. In the final step of the Content Campaign Plan, you connect your content to your business goals. Build offers into each piece of content that allow prospects to get more value, either by consuming more content, giving you their contact information for follow-up, or buying a product or service. Any call to action is better than none at all, but the highest-converting ascension offers are relevant to the content the prospect is consuming. For example, a blog post entitled “10 Ways to Grow More Nutritious Organic Tomatoes” would do well to make an offer like “50% Off and Free Shipping on Organic Tomato Seeds” rather than an offer for carrot seeds. If you want to create content that converts prospects at all stages of the funnel, create a Content Campaign Plan and execute it. It works.